Meeting safety requirements for changing automotive SoC architectures. Traditionally, the electronic control units (ECUs) for individual Advanced Driver Assistance System (ADAS) applications have been placed throughout the car. 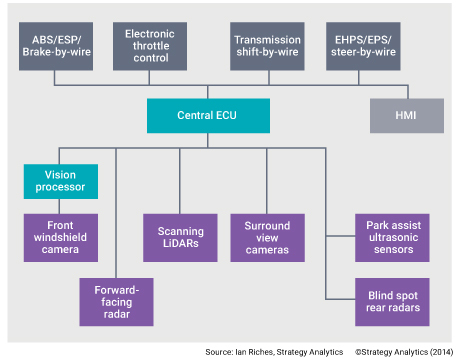 The latest automotive architecture will integrate ECUs for multiple ADAS applications into centralized domains to combine multiple ADAS functions. The new class of integrated domain controller ECUs utilize data transferred from the car’s remote sensors such as cameras, LIDARs, radar, and ultrasonic to the integrated domain controller for processing by a high performance ADAS system-on-chip (SoC). The increased functionality of an integrated ADAS domain controller impacts the ADAS SoC architecture in the ECU, including the SoC-level automotive certification, which remains a mandatory requirement for designers. The IP in the integrated ADAS domain controller SoC must also meet the highest Automotive Safety Integrity Levels (ASILs), must be designed and tested for grade 1 and 2 temperatures, and must fully adhere to the automotive quality management process. In addition, it is important to use automotive-certified IP in advanced foundry processes, since designers are moving to more stringent process technologies, such as FinFETs. This article highlights the new integrated automotive ADAS domain controller SoC architecture, and describes how designers can accelerate their SoC-level certification and time-to-production with automotive-certified IP. According to the August 2016 Traffic Safety Facts Research Note by the National Highway Traffic Safety Administration (NHTSA), “the nation lost 35,092 people in crashes on U.S. roadways during 2015, a 7.2% increase which is the largest increase in nearly 50 years.” It was analyzed that about 94% of those accidents were caused by human error and the rest by the environment and mechanical failures. The opportunity to reduce car accidents is making automotive ADAS even more critical. Automatic emergency braking, pedestrian detection, surround view, park assist, driver drowsiness detection, and gaze detection are among the many ADAS applications that assist drivers with safety-critical functionalities to reduce car accidents. Figure 1 shows an integrated ADAS domain controller SoC with a centralized ECU where data from numerous sensors travels to a central ECU and is then processed via an ADAS processor. Figure 1: Data from sensors travel to a central ECU and processed via a vision processor. Safety-critical applications are significantly increasing the adoption of ADAS SoCs. However, it is required that the ADAS SoC along with all semiconductor components, including the IP, that are integrated into the SoC meet the ISO 26262 functional safety standard. Industry-accredited inspection companies, such as SGS-TUV Saar, are available to audit products and processes for compliance and certification of ISO 26262. The ISO 26262 certification process includes multiple steps, policies, and reports and must start from the very beginning of product development. For example, the failure mode effect and diagnosis analysis (FMEDA), a report that development teams generate, provides all the information regarding the adherence to ISO 26262 from a functional safety perspective. Created by design and verification engineers, the report is a critical component of an ASIL assessment, not just for evidence of compliance but also for design targets and a rating assessment at the end of the development flow. Designated safety managers, separate from the development organization, who are fully trained to monitor the development process, milestones and product reviews, ensure all the documentation and traceability is completed throughout the SoC development flow as defined by the standard. The FMEDA report also includes a summary of the safety features, their development, and verification. It clearly documents the safety features contained in the products and how these products react to the random faults that are injected into them. The FMEDA report is mandatory and is given to all parties involved in the product review process. A standard SoC or IP product development flow starts with register-transfer level (RTL) design, which is then implemented, verified, and validated in hardware and software in the final prototypes. An ISO 26262 compliant development flow adds additional steps over the standard design process including at the very start when defining a core architecture and specification. Designers define a safety plan that includes safety features and goals. The product team and safety manager reviews the safety plan and strategy to achieve the designated functional safety for the end application. It is important to conduct a failure analysis by injecting faults to assess the safety level and the system’s reaction to those faults. The FMEDA shows a fault injection analysis for both permanent and transient faults to assess the impact. The analysis and assessments are clearly documented in the FMEDA report as part of the ISO 26262 certification process along with the safety manuals. This entire process is shown in Figure 2. Figure 2: An example of a standard SoC or IP design with additional ISO 26262 certification steps and requirements. The safety manual in the ISO 26262 certification process defines the safety features in the product, which is critical to the operation of the product. The standard provides some guidelines as to the effectiveness of safety features that can detect possible failures. Safety features for IP product design fall into three categories: protection mechanisms, replication, and various. Protection mechanisms, such as protecting the interface between the IP in the SoC architecture with protection of elastic buffers, parity protection on the data path and configuration registers, and error correction code protection for both writes and reads. Replication is a safety feature category that includes duplicating (or triplicating) key modules and using voting logic to ensure redundancy. Various includes parity checks for all of the state registers, single cycle pulse validity, various dedicated interrupts, and hot state machine protection for bad states. 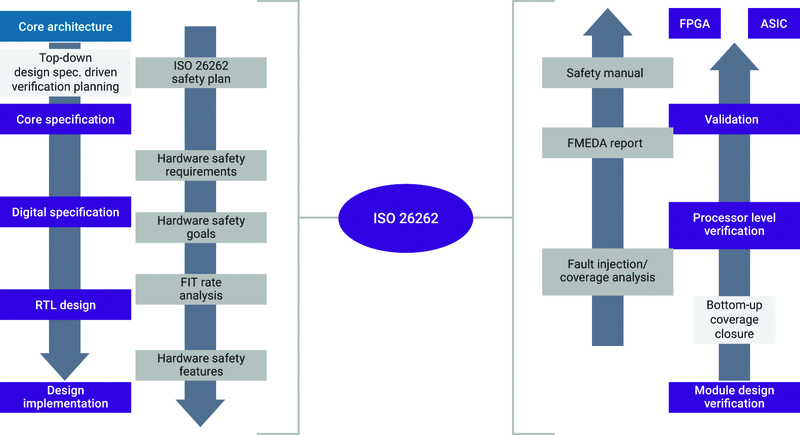 The process to meet ISO 26262 functional safety certification is stringent from creating the FMEDA report, designating a safety plan that defines safety features for the target ASIL, to employing a safety manager and documenting and reviewing every milestone with all the stakeholders. In addition to meeting ISO 26262 functional safety requirements, integrated ADAS domain controller SoC development teams and the rest of the supply chain, including the design IP provider, must adhere to automotive reliability and quality requirements. To meet the automotive reliability standard as defined by the automotive industry, automotive SoCs and IP must be designed and tested to meet very low defect densities which is measured by defects parts per million (dppm). The automotive industry has a requirement for less than one dppm, encouraging designers to set a goal of zero defects per million throughout the automotive product lifetime of 15 years. Meeting temperature grade is another reliability requirement. For ADAS, the highest level of operating temperature is Grade 1 which requires up to 125 degrees Celsius ambient or 150 degrees Celsius junction temperatures. Each company within the automotive supply chain has a proprietary temperature mission profile to which they design and test their products. SoC and IP designers who are developing products for the different ADAS applications take the temperature mission profiles into account during the development process. Different requirements such as electromigration, transistor aging, and transistor self-heating must be considered against the temperature mission profile for the different devices. The trend is shifting from distributed ADAS electronic controller units (ECUs) to a more integrated ADAS domain controllers with centralized ECUs. Due to a high volume of data, the new integrated domain controllers require higher computing performance, lower power consumption and small densities. The adoption of 64-bit processors to handle the high volume of data requires the latest semiconductor features, semiconductor process technologies, and other technologies like IP. Since integrated ADAS SoCs are mainly used for safety-critical applications, designers must comply with the ISO 26262 functional safety standard. This also applies to the automotive IP that is integrated into the ADAS SoC. Designers can accelerate their SoC-level certification with automotive-certified IP that has gone through the required certification process and is deemed certified by an accredited third-party company, like SGS-TUV Saar. Synopsys offers a portfolio of automotive-certified IP that are ASIL Ready ISO 26262 certified, designed, tested for grade 1 and 2 temperatures, and fully adhere to the automotive quality management process. For information, view the DesignWare IP for automotive SoC web page. Ron DiGiuseppe, senior strategic marketing manager at Synopsys, is responsible for automotive segment marketing for Synopsys DesignWare IP solutions for ADAS, functional safety, infotainment and MCU applications. DiGiuseppe brings more than 18 years of semiconductor experience to Synopsys. Prior to joining Synopsys, he held a range of management positions at Xilinx for automotive connectivity IP products, as well as engineering development and management roles for companies including Oki Semiconductor, NEC, and Raytheon Corporation. DiGiuseppe holds a bachelor's degree in Electrical Engineering from San Jose State University and a Certificate in Network Engineering from the University of California.